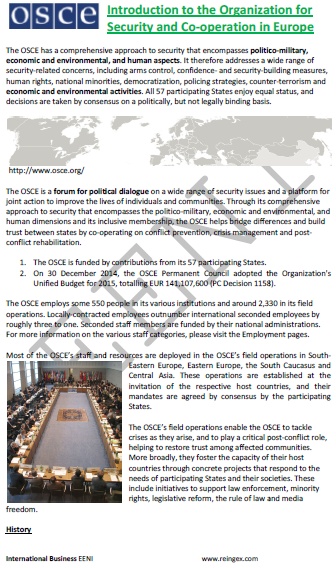 Syllabus of the Online Course (Subject): Organisation for Security and Cooperation in Europe (OSCE). Description of the Online Course: Organisation for Security and Cooperation in Europe (OSCE). In 1973 was created the Organisation for Security and Cooperation in Europe (OSCE) as forum for political dialogue. The Organisation for Security and Cooperation in Europe (OSCE) works on several areas: political, military, environmental, economic development, democratisation, counterterrorism actions, conflict prevention, human trafficking, and border management. In the economic area, the Organisation for Security and Cooperation in Europe (OSCE) works on strength the regulatory frameworks, regional integration, transport networks, border crossing procedures, PPP (public-private partnerships) development, and business climate improvement. The Headquarters are in Vienna (Austria). 2- Asia: Azerbaijan, Kazakhstan, Kyrgyz Republic, Mongolia, Tajikistan, Turkmenistan, and Uzbekistan. 3- North America: Canada, the United States. The Organisation for Security and Cooperation in Europe (OSCE) is a multicivilisational institution (Christianity - Orthodox - Islamic - Buddhist).